Gulet Building in Turkey has centuries old records that some call it Goelette, golet, goleta, gullet, goulet, caicco, caique etc. we Call it Gulet, whatever you name it these is the term used for Turkish gulets or wooden boats to carry cargoes in the shallow waters of eastern mediterranean and they are world recognized for being stable, seaworthy and strong boats that is very commonly used for cruising the warm blue waters of the worlds charter yacht destinations from Turkey to greece and the greek islands, Croatia and thousand islands, Italian riviera, french riviera, spanish riviera, eastern mediterranean, red sea, the arabian gulf and upto Thailand these gulets are being sold and chartered successfuly. Turkish gulet building is famous with their spacious interiors, large galley and beam to beam master cabins, vip cabins, guest cabins are preferred for being comfortable and cosy. 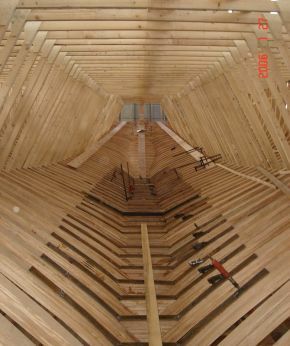 Turkish gulet building industry is mostly concentrated on high quality marine grade African mahogany, burmese teak, iroko, sapelli, ocaliptus, chestnut, white oak, mulberry for the hull and spruce pine, oak, walnut, ebony, olive and various roots for interior furnitures and for their beautiful varnished bulkheads. the state of the art technology is applied for propulsion systems and power steering systems, marine grade anti corrosive cables and fuses, GPS, Global positioning systems and AIS, Automated identification system as well as chart plotters to make navigation as easy as it can be, supplied with bow and stern thrusters and hydraulic systems makes power cruising or sailing like a playground toy with a touch screen. Motoryacht building has been enjoying the utmost attention and became the highlight of recent boat shows recently due to increasing demand worldwide. Space age technological advances in motor yacht building industry and marine electronics has come so far that zero speed stabilisers converted motoryacht so comfortable and they cruise as if cruising on a lake even during stormy weather. Navigational equipments and electronic devices such as AIS, GPS, new generation Chartplotters with all in one technology, Radars, deep sounders that makes navigation as simple as a computer game. advanced thrust and propulsion systems as well as bow and stern thrusters makes their maneourability so easy that they can be docked and undocked even in the smallest areas without error since joysticks for both engine controls and thrusters can be controlled from the flybridge and from stern control panels.